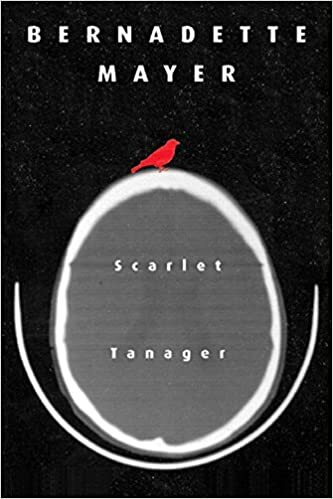 Scarlet Tanager – loudlatinlaughing – Euge! Euge! After I read Bernadette Mayer’s poem, Politician (“It seems to us you convert your farts into speeches”), I immediately headed to the library to pick up the collection of her poetry that includes that one. Oh wonderful Dewey Decimal system, I parked in the 811.54s and went to town, greedily grabbing all of her work and snooping to see what else looked good. i don’t know what to do next, this/is not how anyone should feel, most/bad poetry is badly thought through, it’s/terrible because it’s chaotic, whenever/you read it you feel full, actually/you should feel hungry when you read poetry, it’s like/an amuse-bouche at best, someday/you will have the main course, but/if the poem’s short & excellent, probably/you won’t need it, this/poem will drag on forever, rendering/you full as a whale’s brain, full/as the stupid future, however/you may take a shortcut, hit/on some beauty, maybe, probably/just homework, drudgery/making you feel the sink is full, you/have nothing to eat, why/don’t you just watch goldfinches?